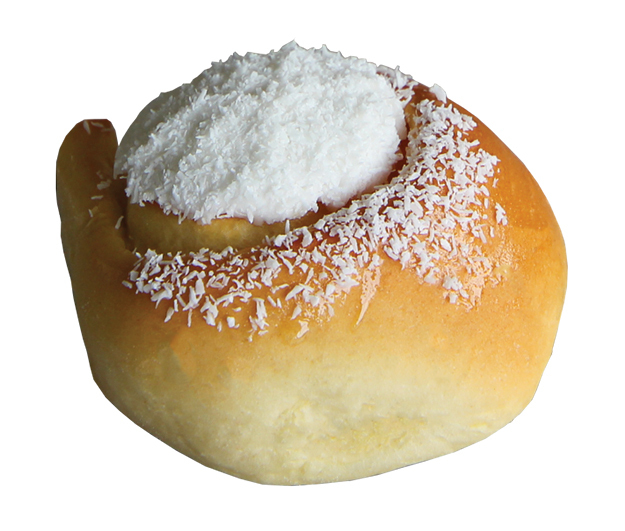 Banjo’s Boston Bun is a delicious large spiced bun topped with a thick layer of coconut icing. Perfect sliced and served with butter. 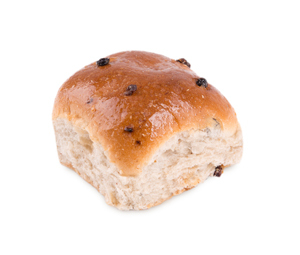 Simply spiced with fruits mixed through Banjo’s Fruit Bun is nutritious and satisfying – filled with juicy sultanas and currants. 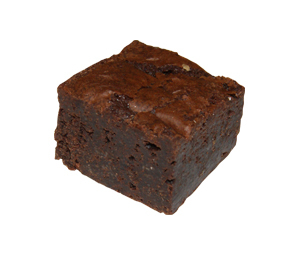 Share some with friends or enjoy as a tasty extra for school lunches. Yum! Wheat flour [vitamin (thiamin), folic acid], water, sultanas, sugar, currants, vegetable oil, yeast, gluten, iodised salt, soy flour, emulsifiers (481, 472e, 471), spice (contains sulphites), calcium sulphate (516), antioxidant (300), enzyme, raising agent (920). Other products manufactured on this site contain: Egg, milk, poppy seeds, sesame seeds, peanuts and tree nuts. Therefore traces may be present in this product. Banjo’s Vegemite Scroll is an Aussie specialty – soft swirled pastry with vegemite and held together with melted cheese, it’s a savoury delight! Vegetarian friendly. 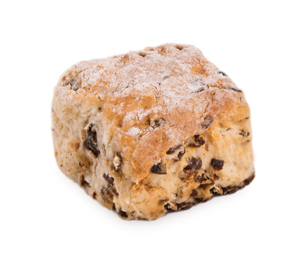 Banjo’s Date Scone is light and tasty – jam packed with dates and delicious warmed with a touch of butter! 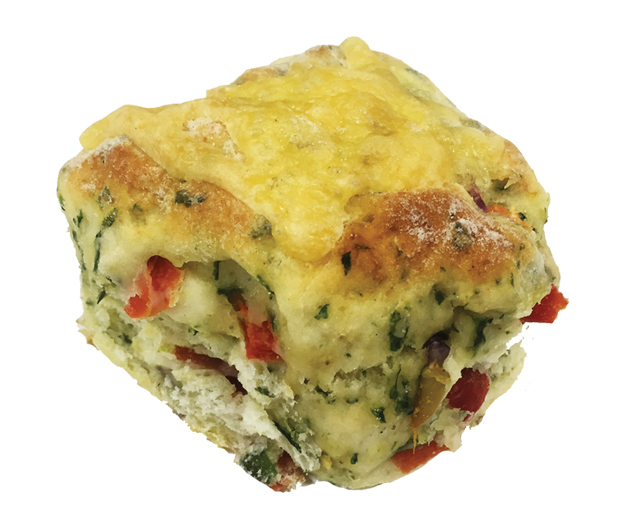 A delicious fresh savoury scone full of spinach, red capsicum, onion and flavour! 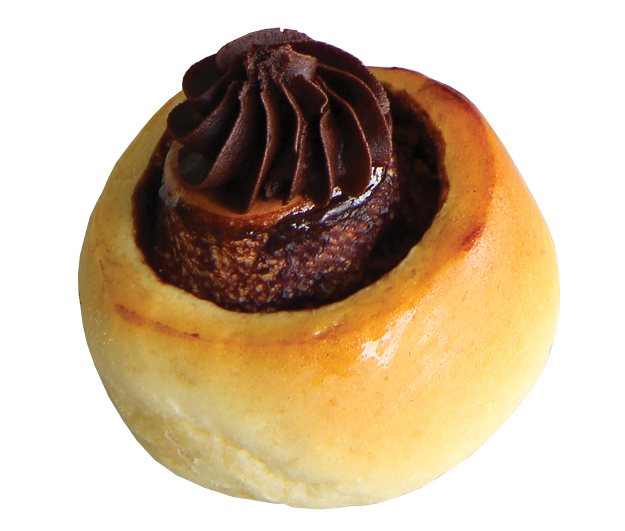 Our Chocolate Scrolls are a chocoholic’s dream! Light fluffy sweet dough filled with a delicious chocolate custard cream and topped with a rich chocolate cocoa vanilla icing. These bitter sweet Lemon Scrolls are a perfect pick me up! They’re a light fluffy sweet dough with a tangy lemon custard inside and balanced with a sweet lemon vanilla icing on top! 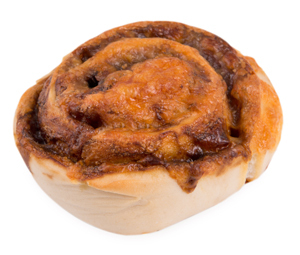 Our Custard Scroll is a perfect treat to enjoy with a cup of tea or coffee. Light and fluffy sweet dough filled with a delicious creamy custard and topped with a sweet coconut sprinkled vanilla icing. 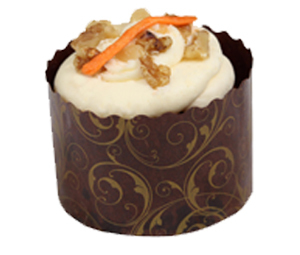 Classic Carrot Cake filled with carrots and walnuts and topped with rich cream cheese frosting. Perfect with your morning cuppa! Wheat, egg, soy, milk, walnuts. Other products manufactured on this site contain: Sulphites, poppy seeds, peanuts and sesame seeds. Therefore traces may be present in this product. 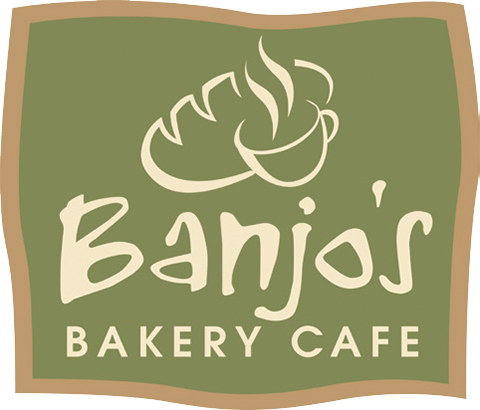 Banjo’s Triple Chocolate Mud cake is the true indulgence…deliciously moist individual chocolate cakes topped with smooth chocolate icing, then filled with a beautiful ganache to give an extra explosion of chocolate with every bite. Other products manufactured on this site contain: Poppy seeds, sesame seeds, sulphites, tree nuts and peanuts. Therefore, traces may be present in this product. A rich, moist, sweet cake with a deep red colour. 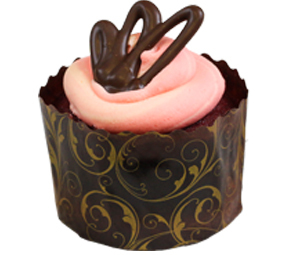 Banjo’s Red Velvet cup cakes are topped with delicious cream cheese icing – simply divine! 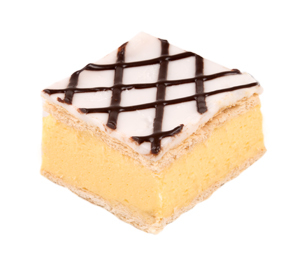 A perfect French Vanilla slice will bring back childhood memories of creamy vanilla custard, flaky layers of pastry topped with sweet vanilla icing and chocolate ganache. Other products manufactured on this site contain: Egg, sulphites, poppy seeds, sesame seeds tree nuts and peanuts. Therefore traces may be present in this product. 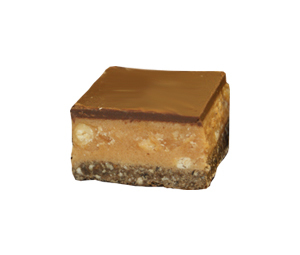 Banjo’s delicious Caramel Slice has a crumbly biscuit base covered in a layer of creamy caramel then topped with melted chocolate. Need we say more? Banjo’s Hedgehog Slice is a classic Australian slice! 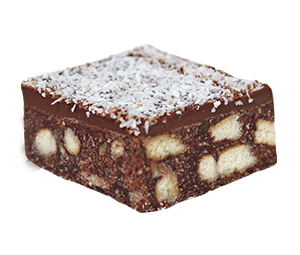 A mixture of chocolate and biscuits topped with a layer of melted chocolate and decorated with coconut. 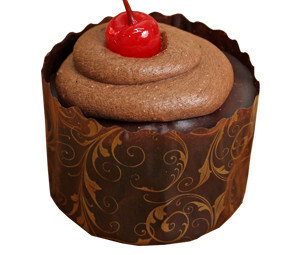 Perfect for the chocolate lover. 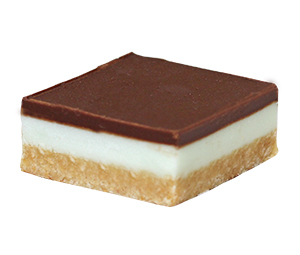 Banjo’s Peppermint Slice is the perfect balance between layers of chocolate, peppermint filling and a golden biscuit base. Sucrose, milk, cream, sugar, cocoa powder, vegetable oil, water, hydrogenated coconut oil, wheat flour, wheat starch, antioxidant (319), food acid (330), wheat bran, high fructose syrup, salt, raising agents (341, 500), emulsifier (492, 322- soy lecithin), vegetable fat, propylene glycol (1520), ethanol, natural flavouring, colours (102, 133), preservative (202), flavours. Other products manufactured on this site contain: Wheat, sulphites, egg, poppy seeds and sesame seeds. Therefore, traces may be present in this product. 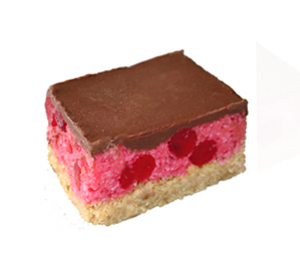 Sweet cherries and coconut combine to make this family favourite…topped with chocolate on a chocolate biscuit base Banjo’s Cherry Ripe is the ideal indulgence for an afternoon treat! 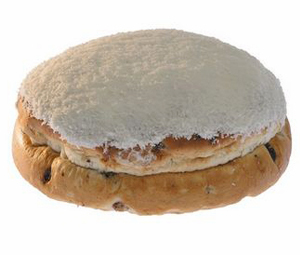 Other products manufactured on this site contain: Egg, poppy seeds and sesame seeds. Therefore, traces may be present in this product. 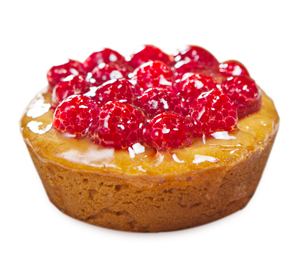 For many a Raspberry Housecake IS Banjo’s – a delicious shortbread base filled with custard and topped with juicy raspberries and a sweet glaze. Other products manufactured on this site contain: sulphites, poppy seeds, sesame seeds, tree nuts, peanuts and soy. Therefore traces may be present in this product. 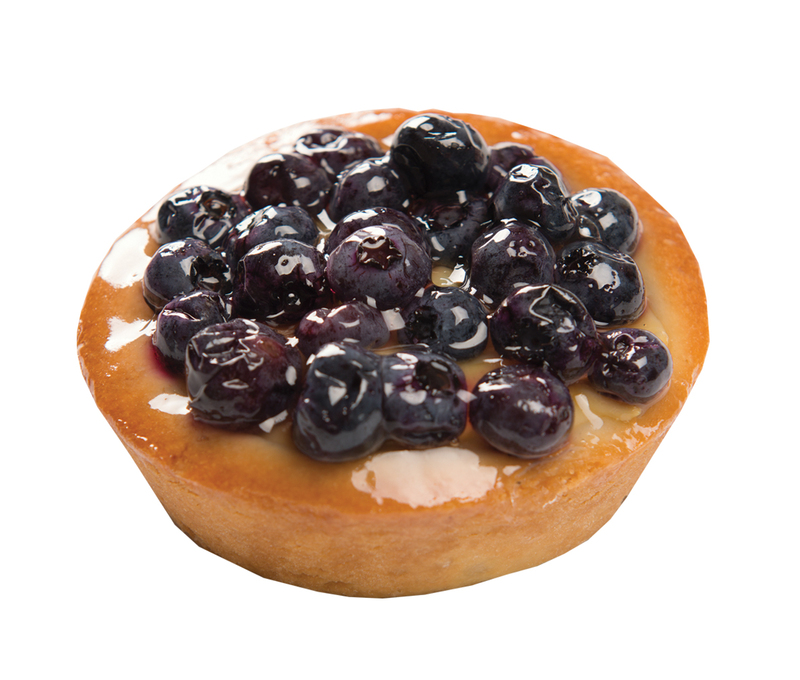 Banjo’s Blueberry Housecake – a delicious shortcrust base filled with custard and topped with juicy blueberries and a sweet glaze. Other products manufactured on this site contain: Sulphites, poppy seeds and sesame seeds. Therefore, traces may be present in this product. 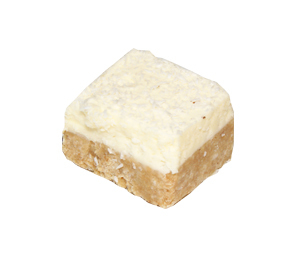 Tangy coconut biscuit base topped with a zesty sweet lemon icing. Other products manufactured on this site contain: Egg, poppy seeds, sesame seeds, tree nuts and peanuts. Therefore, traces may be present in this product. 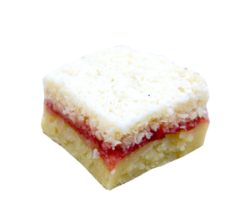 A shortcake base spread with a layer of sweet jam and topped with a fluffy coconut mix. Other products manufactured on this site contain: Soy, poppy seeds, sesame seeds, tree nuts and peanuts. Therefore, traces may be present in this product. Other products manufactured on this site contain: Egg, tree nuts, poppy seeds, sesame seeds and sulphites. Therefore, traces may be present in this product. 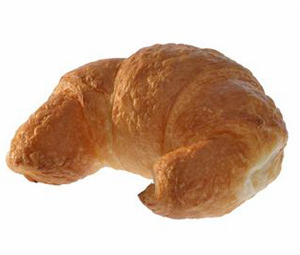 Light and buttery, Banjo’s Croissants are flaky and delicious – perfect as they are or spread with some butter and jam! Delicious layers of golden pastry filled with delicious apple. 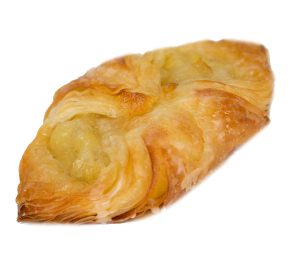 Banjo’s Apple Danish is decorated with a splash of fondant and a brush of sweet gel on top. Try one served warm. 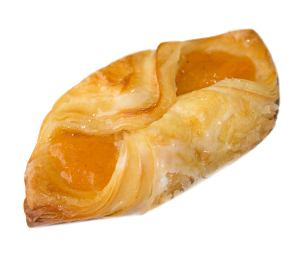 Delicious layers of golden pastry filled with delicious apricot. Banjo’s Apricot Danish is decorated with a splash of fondant and a brush of sweet gel on top. Try one served warm. 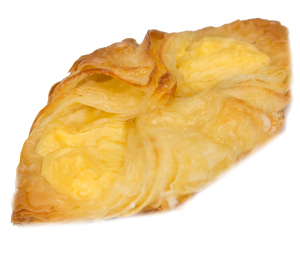 Delicious layers of golden pastry filled with creamy custard. 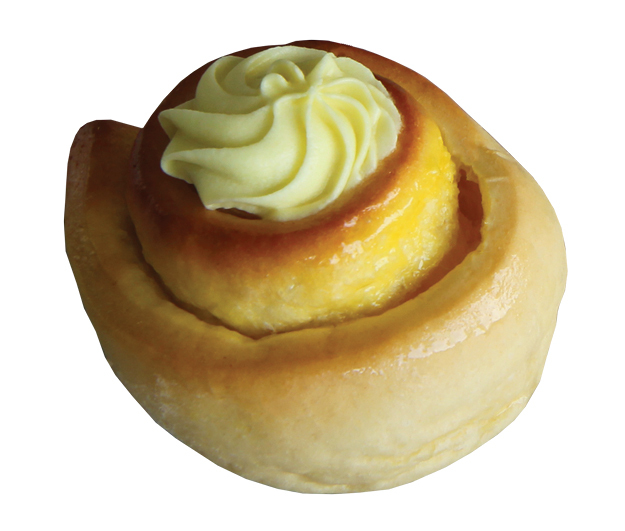 Banjo’s Custard Danish is decorated with a splash of fondant and a brush of sweet gel on top. Try one served warm. Other products manufactured on this site contain: Sulphites, poppy seeds, sesame seeds and nuts. Therefore traces may be present in this product. Delicious layers of golden pastry filled with a mix of sweet blueberries and apple. 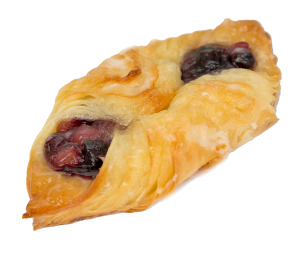 Banjo’s Blueberry Apple Danish is decorated with a splash of fondant and a brush of sweet gel on top. Try one served warm. 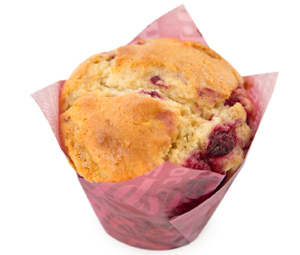 Banjo’s delicious Raspberry muffin – soft and fluffy filled with sweet, red, juicy raspberries. Try one served warm. Banjo’s Blueberry Muffin is blue-berrylicious! 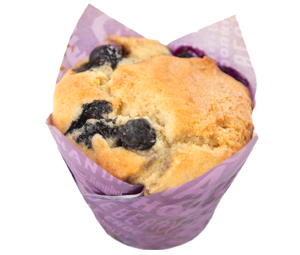 A delicious muffin with plump, juicy blueberries. Try one served warm. Banjo’s Double Choc Muffin is one for the chocolate fans. 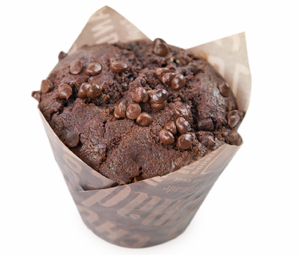 A very chocolaty muffin with moist chocolate sponge packed with chocolate chips and topped with more delicious chocolate chips. Served warm with melting chocolate pieces – just perfect! 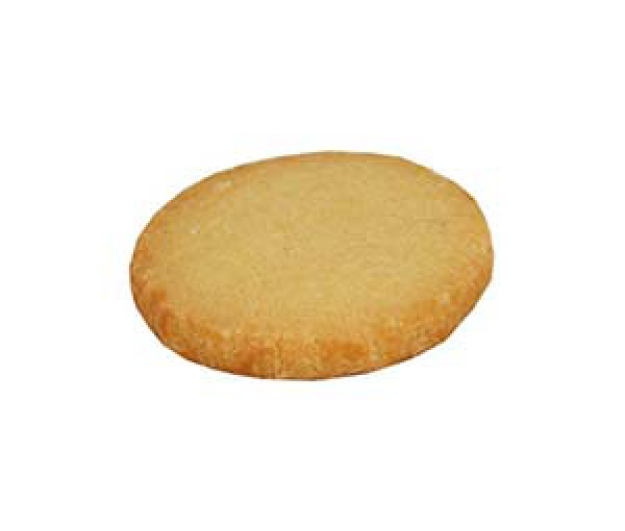 Banjo’s traditional melt-in-your-mouth shortbread. Handmade & delicious! Packaged to share or as a gift. Wheat flour, unsalted butter, sugar, iodised salt, vitamin (thiamin, folic acid). 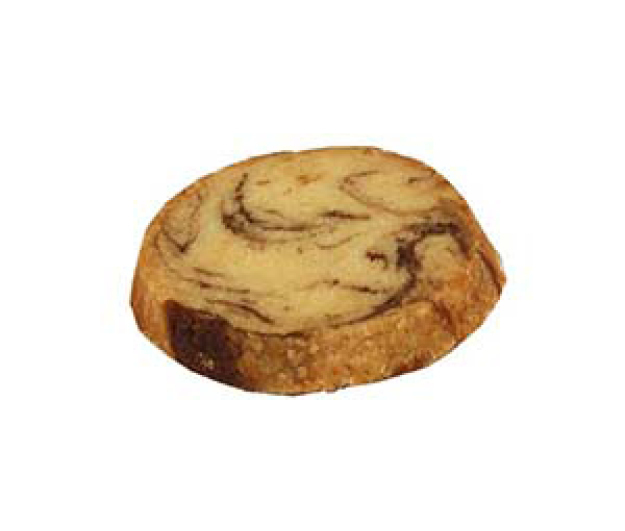 Banjo’s Christmas Choc Swirl Shortbread will melt-in-your-mouth. Handmade & delicious! Treat a pack to yourself or as a gift. 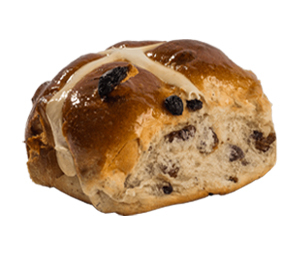 Wheat flour, unsalted butter, sugar, chocolate flavour (0.5%): [water, colours (150d, 155, 151, 133), ethanol, nature identical & artificial flavours, propylene glycol (1520), food acid (330), preservatives (202, 211), vegetable gum (415), emulsifier (433)], iodised salt, vitamin (thiamin, folic acid). 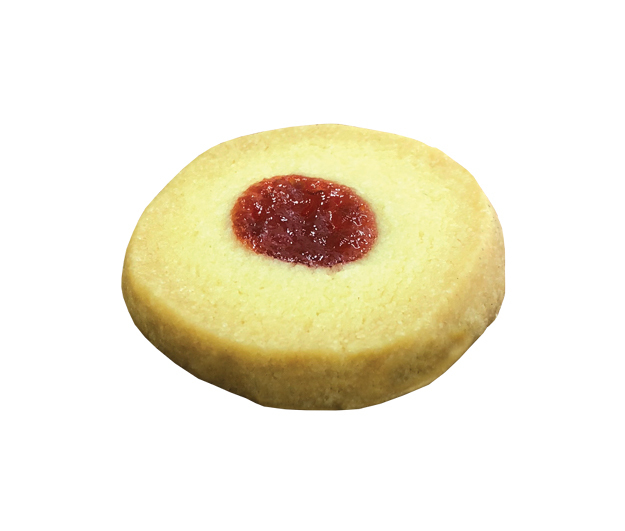 Banjo’s traditional shortbread, handmade with a delicious berry blast centre. Other products manufactured on this site contain: Egg, sulphites, poppy seeds, sesame seeds, tree nuts, peanuts and soy are produced. Traces may be present in these products. 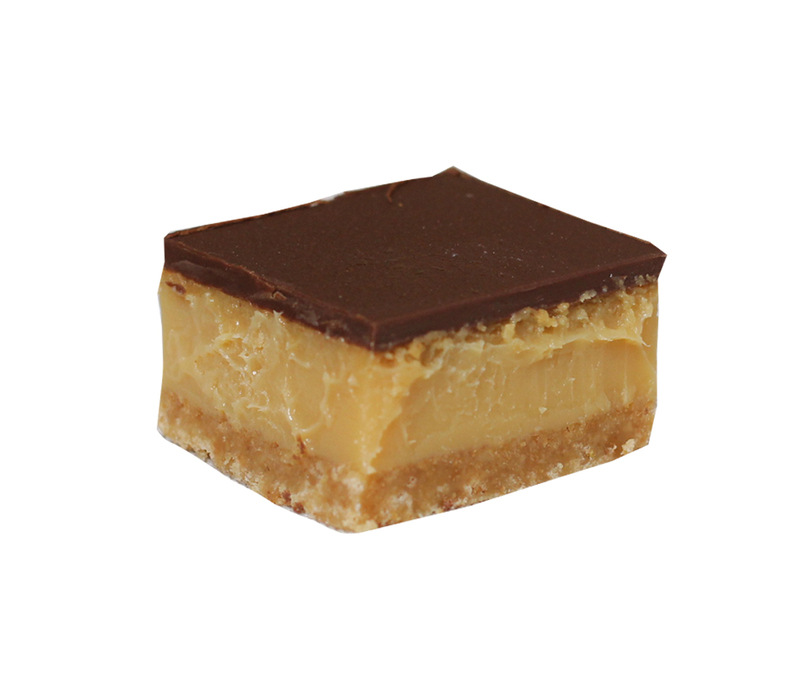 Banjo’s traditional shortbread, handmade with tasty caramel & sea salt topping. Banjo’s traditional shortbread, handmade with a fresh citrus tangy centre. 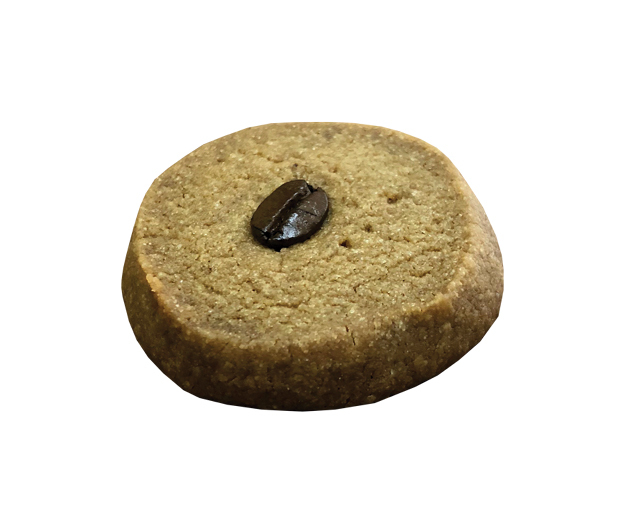 Banjo’s traditional shortbread, handmade with a full-bodied coffee flavour and coffee bean centre. 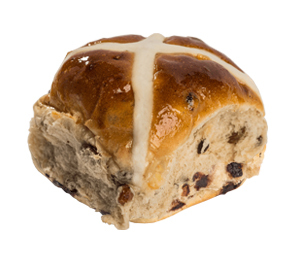 Banjo’s Gourmet Hot Cross Buns are bursting with sultanas, currants, spice and tangy citrus peel. 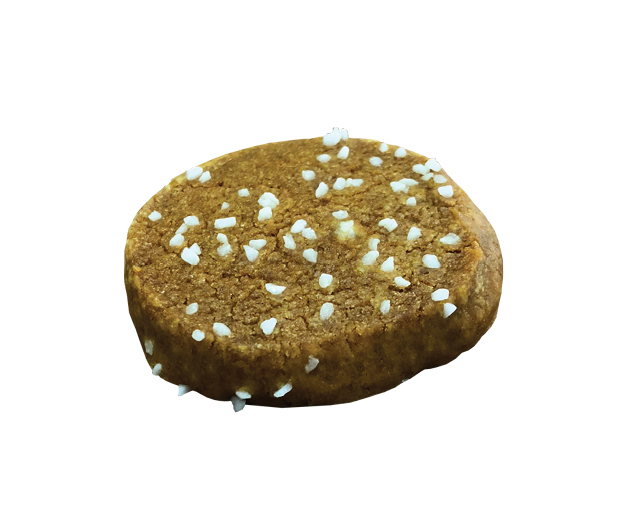 Other products manufactured on this site contain: sesame seeds, poppy seeds and nuts. 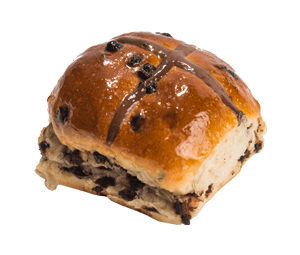 Banjo’s Traditional Fruit Hot Cross Buns are full of juicy sultanas and currants, with some added spice. 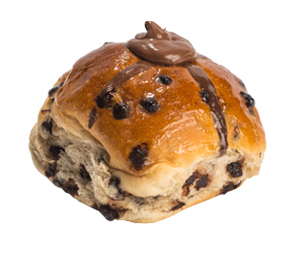 If you think Easter is all about chocolate – you’ll love our DOUBLE CHOC HAZELNUT HOT X BUN! Bursting with cadbury chocolate pieces and infused with delicious choc hazelnut spread…just the way we like it! Grab one today – available for a limited time only.